The Sometimes Preacher | Page 22 of 91 | Reflections on Jesus, Scripture, Theology, Ministry, and Church. Carlos Whittaker’s life is full of hilarious, awkward, and powerful moments. Whether it’s a bird feasting on his children’s just-released flock of pet butterflies, buying a round of drinks for a returning troop of soldiers, or humiliating a girl by being too romantic, Carlos Whittaker lives his life in the moment. He is a man who was born with an innate ability to seize every moment and draw every last drop of life out of it, and in his new book Moment Maker, he wants to show you how you can live this way, too. 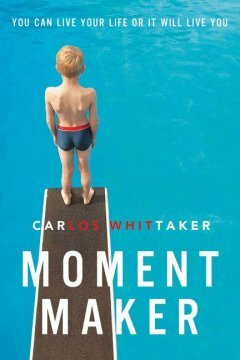 Whittaker identifies three types of moments in life: created moments, received moments, and rescued moments. Created moments are those special events in life that we make for others – birthday parties and romantic dates, for examples. Received moments are those times in life when things just happen, almost out of the blue. Rescued moments are what happen when your plans go awry and you’re faced with the choice to double down on the moment or just cash out. The common element of the three types of moments are that they push us beyond the boundaries of our self-centeredness and into the lives and hearts of others. Being a moment maker is about living for others on purpose. It’s about pursuing the happiness and well-being of those around you, whether they are family, friends, or strangers. Moment makers imagine possibilities in life that the rest of us don’t see. They open their eyes to those around them, living according to the schedule of love rather than their daily calendars. With often-funny and always-engaging stories, Whittaker invites the reader to wake up to the possibilities of a life full of created, received, and rescued moments. This book is particularly challenging for introverts like myself who would much rather enjoy the comfort of a quiet room and a good book than take the risk of moment making for the sake of others. Not all of us will be able to live life the way Carlos lives his, but we can all stand to be more invested, and more interested, in the happiness and well-being of others. Disclosure of Material Connection: I received this book free from the publisher through the BookLook Bloggers book review bloggers program. I was not required to write a positive review. The opinions I have expressed are my own. It’s been about two and a half weeks since our sweet Zekey passed away. I think about him every day, almost all day. But when I think of him now, I don’t usually remember the sweet, mischievous little guy running our house in Westerville. Nor do I think of the sickly little boy bedridden at my parents’ house in Toledo. No, when I think of Zeke now, I see a tall, handsome young man with tons of dark hair, big brown eyes, and a big smile on his face. I see him standing in front of me, without seizing, without twitching. He is ready to talk to me. We’re about to have our first conversation. This is Zeke as he is now, in heaven with Jesus awaiting his resurrection. He is whole. He is healthy. He is untainted by that damnable disease. Although Zeke’s life was short, and he was sick for almost half of it, he has left a profound impression on this world. If you’re reading this, then it probably means that his life and death have moved you in unexpected and unlikely ways. I believe that this is God calling you.